ORDER NOW and get it delivered in just 2 days with Prime! ROSE BUDS & PETALS - Handpicked finest quality roses - package in resealable stand up pouch to preserve their natural scent- great for tea, cooking, baking and craft project. CULINARY GRADE: Our botanical flowers are edible and kosher certified. They can be adding to salads, soups, stew, baked goods, teas and other beverages. 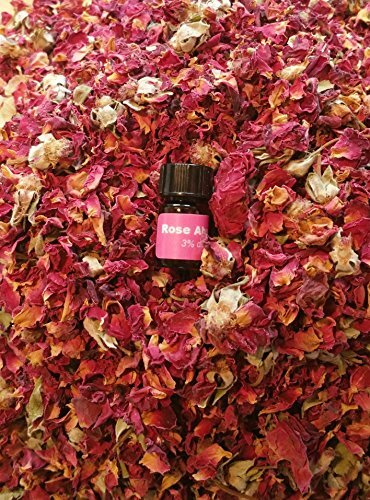 RICH FRAGRANCE - Natural rose scent makes these ideal for use in potpourris and sachets (for freshening a wardrobe or a room), in making bath soaps, bath bombs, shampoos, rose water toner and other cosmetics, or for infusing in facial masks or eye pillows. DEEP COLOR - The deep natural color makes these perfect for natural decoration of candles for sprinkling in bath tubs, as a wedding confetti, and even for keeping in a basket to improve the aesthetics of a place. BONUS- Package includes a 5/8 dram bottle of rose absolution essential oil as FREE BONUS - making it the best deal- ! If you have any questions about this product by bMAKER, contact us by completing and submitting the form below. If you are looking for a specif part number, please include it with your message.